Watershed ecosystems are unique ecologies that provide services and functions that are critical for the sustenance of natural water bodies as well as people that depend on them. However, there is limited information on plant species composition and distribution in most watershed forests in Nigeria. The watershed forest surrounding Arinta waterfall in Ipole Iloro, is an area protected by local communities, but facing anthropogenic threats associated with increased patronage from tourists from within and outside Nigeria. This study determined the floristic composition and vegetation structure in the Arinta watershed forest, using a stratified sampling technique. Nine sample plots, each 20 m by 20 m, were laid along three horizontal strata from the river valley upwards at 456 m, 470 m and 489 m above sea level. Within each sample plot, all plant forms were identified and enumerated, while growth variables like diameter and total height were measured for tree species. The species diversity indices were determined for all tree species encountered. Ninety two plant species from 51 families were found in the watershed ecosystem. These included 48 trees, 12 shrubs, 12 lianas, 16 herbs, 1 grass and 3 fern species. 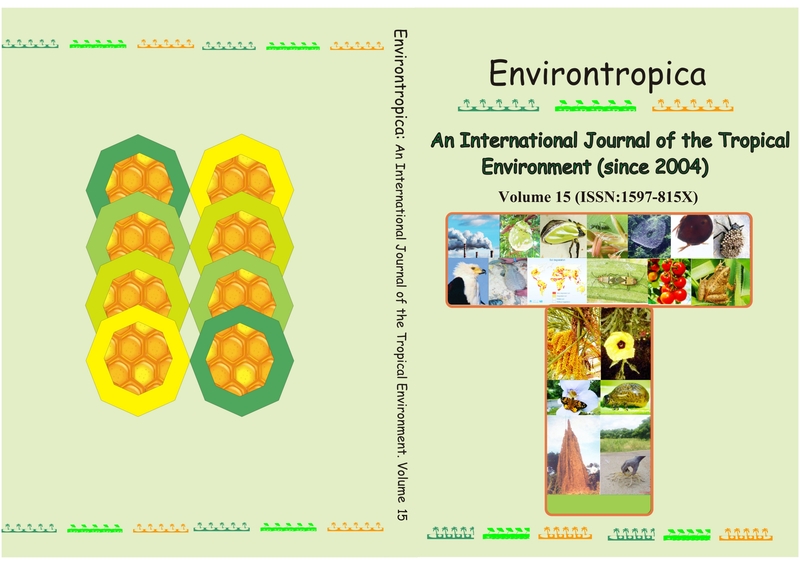 Ceiba pentandra was the most dominant species with an Importance Value Index (IVI) of 43.54% while Chrysophyllum albidum was the least (IVI = 0.78%). Fabaceae family had the highest species representation (14.13%) in the plant population. Shannon Wiener diversity index was 3.28, while the species evenness was 0.85. Approximately 64% of the tree species population had heights <10 m, while only 0.2% had heights >30 m. Similarly, tree species in diameter class 1 – 10 cm had the highest population of 630 wildlings/saplings ha-1.. The high floristic composition indicated the need for the conservation of the watershed which provides both protective and productive functions for the environment as well as the local community.